Over the past 5 years, Indian e-tailing market has grown at a 40% CAGR from USD 4BN in 2014 to USD 24bn in 2018. While the rapid growth benefitted the leading e-tailers and more importantly consumers, it came at an expense of affecting traditional retailers whose sales were directly impacted. Even thousands of sellers who came in large numbers to list on marketplaces hoping to ride the e-commerce growth wave were left disappointed as sales were largely driven by mobiles and electronics – the two categories dominated by marketplace linked and preferred sellers. This resulted in uniting a strong lobby against e-tailers who strongly complained that the marketplaces weren't truly operating as marketplaces and engaged in anti-competitive, predatory pricing practices. As a result, government enacted several policy changes that directly aim to limit marketplace's ability to offer discounts and thus level the playing field for small retailers. The above policy changes as implemented on 1st February 2019, forces foreign funded e-commerce platforms to restructure their operations and supply chains. With the internet retail in India sized at USD 24 BN in CY18, the changes are likely to have far reaching consequences to not just internet retail but also to overall retail, business and consumer sentiment, employment, GDP, and beyond. The new policy changes have a significant exposure on the overall-entailing GMV – 70% of which is captured by the two market leaders – Flipkart and Amazon. 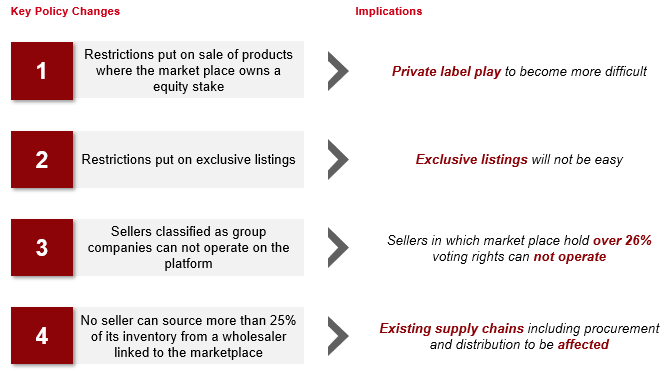 The key products categories that are affected by the changes are – exclusive listings, private labels, and listing by sellers who are linked to marketplaces. RedSeer estimates that the overall GMV threatened is ~USD 15BN, a staggering 45% of the overall expected GMV in 2019. As observed in the two weeks following policy implementation, marketplaces have been quick to circumvent the policy changes and the overall impact is likely to be much smaller than earlier anticipated. RedSeer, through its deep market understanding of the Indian e-commerce is set to unveil a detailed report on the implications of the new e-commerce retail regulation and policy stand. In 2016, Indian government clarified the rules relating to foreign ownership in e-commerce retail. Amazon Inc. lowered its sales guidance for the first quarter due to the new rules, sending its shares down by more than 4% on Friday, 1 Feb. The above policy changes as implemented on 1st February 2019, forced foreign funded e-commerce platforms to restructure their operations and supply chains. 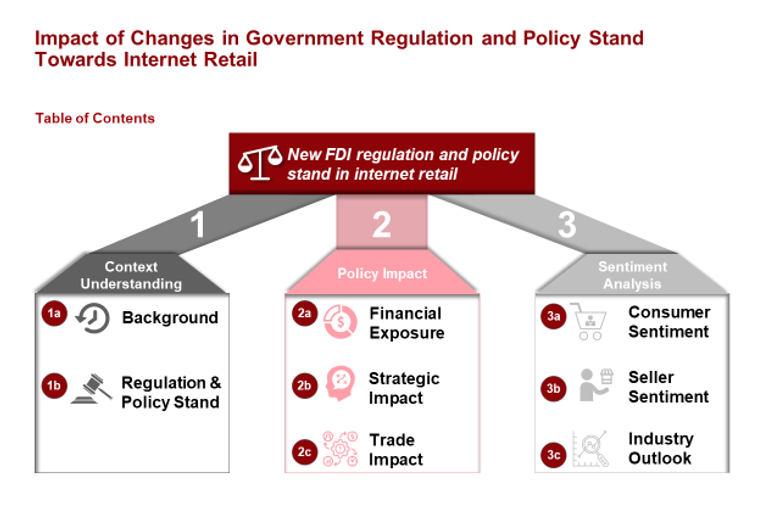 With the internet retail in India sized at USD 24 BN in CY18, the changes are likely to have far reaching consequences to not just internet retail but also to overall retail, business and consumer sentiment, employment, GDP, and beyond. How are the incumbents managing the policy changes? How will it impact small retailers? 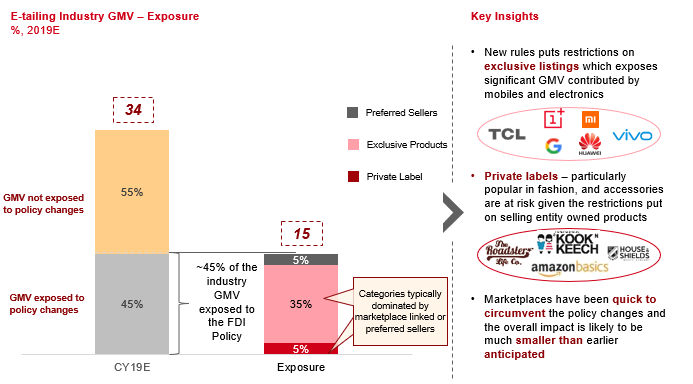 How real is threat faced by incumbents from for big Indian retailers e.g. Reliance? What are the key challenges and opportunities? 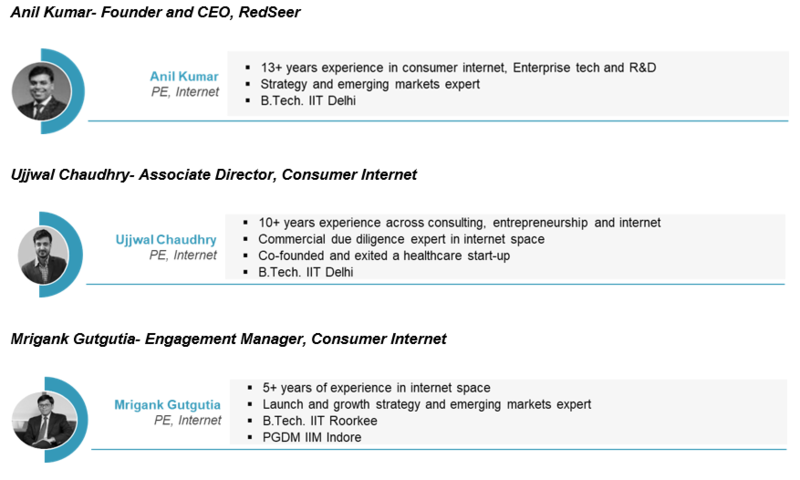 RedSeer will synthesise inputs from the above research studies and leverage its deep internet industry understanding, and proprietary knowledge to provide a holistic view on the impact of changes in regulation and policy stand towards internet retail in India.